I'm the (self-proclaimed) "Espresso Guy." I created this website to educate the home espresso making newbie and to provide recipes, tips, and troubleshooting steps for those already pulling their own espresso shots. If you're having trouble deciding what to buy, there's guides on buying beans and equipment. If the concept sounds familiar, you’re not alone. High end espresso bars have been offering a small glass of water — tonic, sparkling, or mineral — with espresso for at least a decade. So we’ve all been mixing “espresso tonics” for years in our own stomachs, if you think about. Still, the idea of mixing espresso with tonic water in a cup itself isn’t exactly a new trend either. All of the above headlines come from British publications, which leads me to suspect this idea only recently made its way to the UK. Digging a little deeper, I found an Eater article on the subject of mixing espresso with tonic water — from two years ago. Eater’s 2015 article explains that this was not a new concept at the time: “The idea of mixing tonic water and coffee is not an unfamiliar one,” with its origins in barista competitions. What makes tonic water and espresso a good pairing in the first place? I can’t say for certain, but I can offer a conjecture. Espresso has a certain harshness to it, while tonic water is refreshing. Both have the distinct characteristic of feeling thick or heavy in the mouth, with espresso leaving behind a strong aftertaste, and the carbonation in the tonic water helping cleanse the palette. Alternately, it’s a similar appeal as an Americano. The addition of water draws out the fast punch of an espresso into a longer affair, while still retaining the refined nature of a shot of espresso. Sort of like a fancy cocktail, but with espresso instead of alcohol. Vending machines capable of making cappuccinos, lattes, and other espresso beverages are nothing new. You may have used one while staying up late at college, or struggling to keep your eyes open during break on jury duty. The espresso they make tends to be mediocre, but it’s better than nothing. But that’s changing. A startup called Cafe-X has taken the espresso vending machine concept and given it a high tech twist. Since they had one up and running in San Francisco, where I live, I figured I should head over and try it myself. The machine sits in a corner of the ground floor of the Metreon, a mall complex that also features a Target and a movie theater. A crowd had formed around the machine, which features a big window in the front so you can watch the high-tech “magic” at work. Two Cafe-X employees where on site to answer questions and help customers punch in orders. A pair of high-end superautomatic machines make espresso drinks, and a robot arm shuffles paper cups between the machines, pumps for syrup, and pick up windows. These machines differ from your standard espresso vending machine in a couple of important ways. First, the robot arm and multiple espresso machines mean that it can make more than one drink at a time. While it does take up more space than a traditional espresso vending machine, it also means that orders can be streamlined for efficiency to reduce line speed. 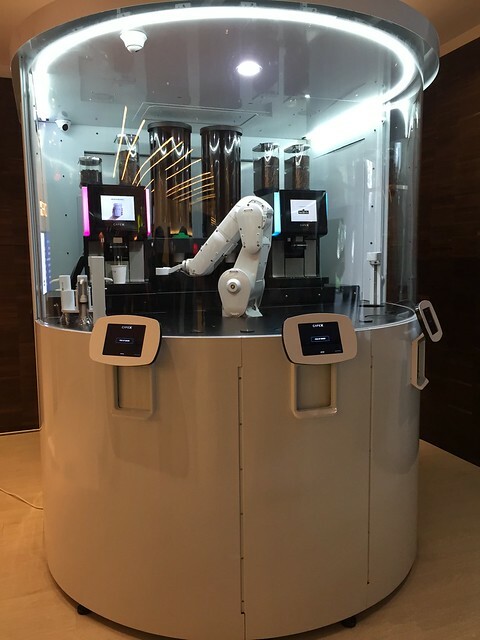 The completed drinks are placed in a queue by the robot arm until you punch your order code into the tablet, at which time the arm moves your cup into the pickup area. Second, Cafe-X has focused on quality. They’ve partnered with a number of high end coffee roasters to tweak the machines variable’s to make the best possible espresso out of the roaster’s beans. I suspect the espresso machines themselves are off-the-shelf products, though their branding had been covered up or removed so I’m not sure which model they’re using. It did make a perfectly good cappuccino, although the foam didn’t have the latte art you’d expect at a good cafe. But there are reasons to be skeptical that Cafe-X’s machine could truly work without human supervision. One issue that I immediately noticed was the machine sits on a raised platform. Someone in a wheelchair would not be able to get to their coffee without help. I imagine that could be addressed through a new design. Another issue is that the machine isn’t aware of its surroundings by any means. During my visit, some kind of enormous cockroach wandered over. One of the Cafe-X employees scrambled to get the cockroach into a cup and away from the machine. Vending machines have similar problems, of course. The employee joked to me that he would have prefered if the robot could have dealt with the problem since it wouldn’t have been as afraid of the insect as he was. So while Cafe-X isn’t the perfect replacement for a cafe, it could be a replacement for your traditional espresso vending machine. While the robot arm is impressive I do have to wonder if it’s truly necessary. In an office setting for example, I don’t think it would be too onerous to ask the employees to place their own cups and pump their own syrups. In a setting like that the only advantage is that Cafe-X dials in the right settings to the machine and maintains them, but it hardly justifies the bulky machine. Is Cafe-X just a gimmick? Right now, I think the answer is clearly yes. The footprint of the thing is far larger than your average vending machine, and in many situations there’s no benefit to the robot arm. But that doesn’t mean there’s no future in espresso made by robots, it just means that it isn’t here yet. Of course, the next model from Cafe-X could easily prove me wrong. Last month CNET broke down the caffeine content of espresso, cold brew, and drip coffee. The timing of the article couldn’t be worse — interest in cold brew coffee picks up in the summer and dies out in the fall. But there’s still some interesting points worth considering. First, the amount of caffeine you consume depends both on the brewing method and on how much you consume. Generally for espresso that’s only a shot or two, but varies a little more with drip coffee. Second, cold brew is typically made as a concentrate and diluted with some water, though the amount of dilution often varies significantly. What’s a little surprising here though is just how much caffeine is in cold brew coffee compared to espresso and drip. I’m no chemist, but I’d assume this is related to both the longer steep time and higher coffee to water ratio of cold brew. If you’ve never tried cold brew coffee I’d definitely encourage you to do so, though maybe wait until hotter weather makes it more palatable. It’s simple enough that anyone with a coffee grinder can make it at home. (And yes, once again I swear I’ll add cold brew techniques to this website someday.) Compared to drip coffee, cold brew has a surprisingly “heavy” texture that’s similar to mineral water, but otherwise smells similar to drip coffee. Despite CNET’s findings, I’ve always found the caffeine rush from cold brew to be fairly mellow. But maybe my body is different than yours — what do you think? I’d suggest testing this one out on your own. Espresso machine… in the bathroom? No thanks. Matthew Muenster is a contractor best known for his appearances on HGTV. Recently he’s made headlines for suggesting a truly bizarre bathroom renovation tip: including an espresso machine in your bathroom. Wait, what? Sure, bathrooms and kitchens both have running water — and you can wash your hands in either room — but the similarities pretty much end there. For Seinfeld fans, Muenster’s suggestion evokes the episode where Kramer installed a garbage disposal in his bathtub. Some lines aren’t meant to be crossed. Muenster defends his decision by saying that he wants coffee in the morning with his shower. Well, sure. That’s all well and good. But most of us also want breakfast in the morning, and that doesn’t mean putting a stove or a refrigerator in the bathroom; it simply means walking into another room. I suppose there’s a certain convenience in having an espresso machine in your bathroom that sounds appealing at first glance. But there’s two major problems with this. First, coffee beans are notorious for absorbing smells. Do you really want your espresso to have the smell and taste of your bathroom? No thanks! Second, coffee grinders and moisture are mortal enemies. No matter what type of coffee you’re preparing you’ll want freshly ground coffee. I don’t care how well ventilated your bathroom is, a couple months worth of hot showers will turn any grinder’s burrs to a pile of rust. So let’s not kid ourselves; we have separate rooms in our homes for a reason, and espresso does not belong in a bathroom. I’d understand if you wanted to put an espresso machine in your office, bedroom, or even a hallway. But in a bathroom? No thanks. NASA views anything greater than 60 pounds per square inch of pressure as a safety concern, and brewing espresso requires at least twice that. To minimize the danger of a blowout, the engineers replaced the traditional rotary pump with a plunger—like in a syringe—driven by an electric motor with just enough power to do the job, and no more. But the good news is that all the effort seems to have paid off. So if one day humans do establish a colony on Mars, at least we’ll still be awake when the ship lands.